inPhoto ID software (automatic ID photography software, TWAIN driver) is updated to version 1.6. With the new functionality and GUI improvements inPhoto ID software has become even more reliable and robust. 1. Olympus camera support. Now all Olympus cameras listed here can be supported by inPhoto ID software. The image preview window for Olympus cameras has 320x240 pixel size, and the frame rate is 5-7 frames per second. 2. The support of new Canon cameras (Canon Powershot A620 and Canon Powershot S80) is added. The new Canon cameras are tested with inPhoto ID software, and they work very well. 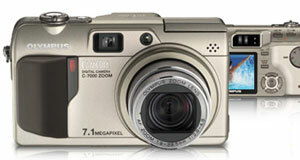 Canon Powershot A620 is a good solution for ID photography, it works fast due to USB 2.0 interface. This camera is also good for macro imaging (e.g. capturing the fingerprints from the close distance), the macro mode is controlled with inPhoto ID software. 3. The image rotation controls are transferred to Menu / Camera. Now the access to the image rotation option has become easier. If you need to rotate the image just go to Menu / Camera and check the appropriate option. The rotated image will be captured either to the TWAIN compatible application (Asure ID software). There are four options of image rotation control: automatic, when the image in Preview window is rotated depending on the camera orientation, and manual by +90, -90 and 180 degrees. To disable the image rotation check Rotation off. 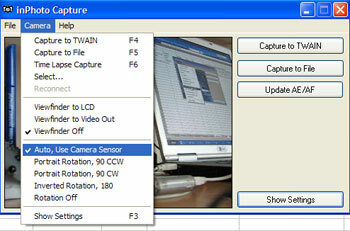 The user can also enable the image preview on the camera LCD and camera video output in Menu / Camera.